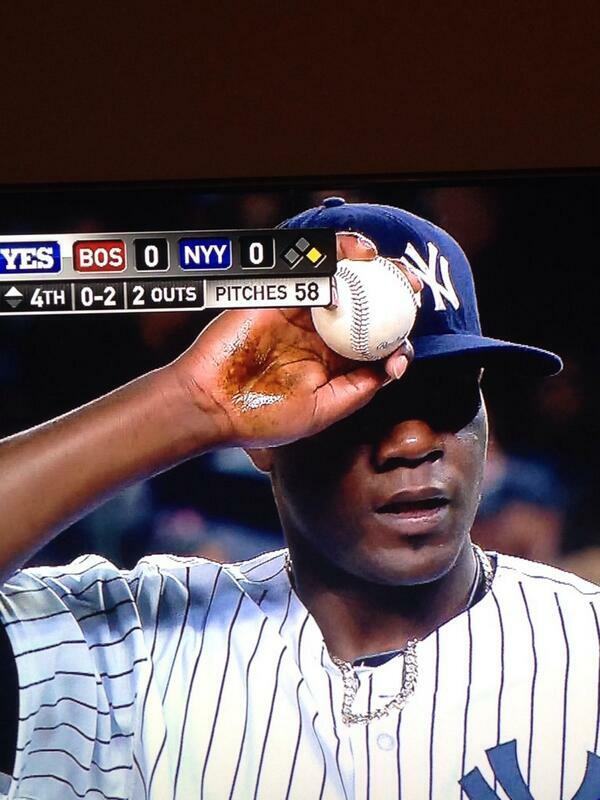 What exactly was on Michael Pineda’s hand? While flipping between the Mets and Yankee game last night, I couldn’t help but do a double take at Michael Pineda’s pitching hand. I froze the TV and snapped a picture (as seen above). My father and I began to look at it with a little bit of a laughter and disbelief that no one was doing anything about this. If you’re going to “cheat,” at least do a better job of hiding it. By the time I took to twitter to discuss this, the topic was already trending in the NY area. How could such a blatant display of disregard for the rules go unnoticed by the field officials? It felt like everyone was fixated on staring at Pineda’s hand, everyone but the Red Sox and Umpires that is. I know there have long been discussions in attempt to compare pitchers altering the baseball to PED use in the game. That’s quite a stretch. Pitcher’s aren’t making life altering decisions with their actions, nor are they taking substances that are being illegally consumed. One has ruined the games reputation, while the other is as much a part of the games past as peanuts and Cracker Jacks. For whatever reason, this has long been accepted. Pitchers have been attempting to get a better grip on the ball or doctoring it, whatever way you want to look at it, since the games creation. While it was much more a case of “let’s see how much I can get away with” at one time, today there are much more subtle attempts. There just isn’t room to get away with too much anymore. With the introduction of camera’s being installed to view every inch of the ballpark, it’s nearly impossible to get away with anything. It’s well-known that pitchers use the likes of pine tar, sun screen, rosin etc. to help get a better “grip” on the ball. Anyone who has thrown a baseball on a very cold day or very hot day, knows what a struggle it can be to get a proper grip on a baseball. I’m not saying that some pitchers don’t exceed the necessary amount to gain an advantage, but I can at least understand where they are coming from. What was on his hand exactly? It’s hard to tell. If you ask me, it’s some sort of pine tar mixture. But Pineda had this to say. Honestly, I don’t really care what was really on his hand. But that is not a combination of dirt and sweat. At least be honest with us, everyone knows what dirt looks like on their hands and that’s not it. If pine tar is going to be acceptable, then go ahead and own up to it. Was he “cheating?” Maybe by rule book standards, but I don’t think this is anything to get worked up about. Either way, I don’t think we will be seeing Pineda on the mound with dirty hands anytime soon.